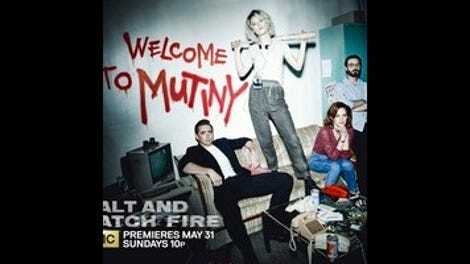 As season two of Halt And Catch Fire charges ahead, the exhilaration of its breakneck pace increasingly underscores how inevitable its characters’ eventual disappointments are going to be. It’s not just that Mutiny is underfunded (tonight, Cameron and Donna tell the programmers that Mutiny can’t pay them any more, offering shares in the company instead), it’s that Mutiny can’t become anything. Just as Cardiff Electric, after producing one decent machine and one kludgy knockoff, closed its doors without becoming the major player Joe MacMillan thought he could turn it into, and Joe and Gordon can’t become Steve Jobs and Steve Wozniak, Mutiny can’t become the real force in online gaming and social networking Cameron and Donna envision. If Halt And Catch Fire existed free from the real-world entities Cardiff and Mutiny are competing against, then maybe Cameron—tonight basically creating the first-person shooter genre in the midst of a Mutiny dart-gun war—could go on to create Wolfenstein, and Donna—her chatrooms tripling in number by the day— would be the basis for some variation on The Social Network. Knowing that all of the creativity, and energy, and pain these characters are going through can, in the show’s reality, at best only reward them with historical footnote status becomes more poignant as the second season progresses, because the show has found a way to make us care more about them. Last week’s (excellent) episode put Donna, Gordon, Cameron, and Mutiny in crisis, shattering the illusions that they were all operating under—that Gordon’s newfound wealth was a springboard to success, that Mutiny could string together enough purloined hardware realize Cameron and Donna’s vision, that Gordon and Donna’s marriage could exist in a state of harried, manic flirtation. This week, the show only heightens the crisis by showing how endemic looming crisis is to the lives everyone has chosen to follow. While the reemergence of John Bosworth: Super-Salesman appears to be a positive step in righting Mutiny’s leaking ship, the episode also reveals how tenuous the Mutiny business model truly is—and shows Mutiny heading straight for the human iceberg that is Joe MacMillan: Man of Ideas. In season one, the show expended so much energy on building up Joe MacMillan as mysterious antihero that other important elements were wan and underdeveloped. This season, Lee Pace has had the luxury of playing a more humbled Joe, and it’s looked good on him. (Shed of hair product and power tie, Joe’s tortured soulfulness seems practically human). But it was only a matter of time until the old Joe, the one who’s smashed up two companies and is now relegated to basement data entry, reemerged, and, while there’s the definite danger of him unbalancing Halt And Catch Fire once again, at least this time, we understand and care about the characters who are going to be affected. For all the game-playing going on—once Gordon catches on to the fact that Joe’s pulling another power play, they both tacitly acknowledge that they’re able to blackmail each other into continuing—the bond between Joe and Gordon was never all about power. As in the dinner party scene last week, and their waiting room talk in the pilot, Joe and Gordon have genuine affection and respect underlying all the plotting (Joe’s and the show’s), and Pace and Scoot McNairy play these quiet moments with a wary warmth. And tonight, when their beat-the-clock caper to sneak Gordon’s hardware into the mainframe in the middle of the night leads Gordon’s shocking collapse to the floor, both Joe’s concern for Gordon and Gordon’s increasingly desperate attempts to deny that his increasing physical ailments (nosebleeds, shaking hands) are anything to worry about, both men are more affectingly human than they were allowed to be for most of last season. Speed is catching up to the characters. Not just in Gordon’s literal sense—it’s implied that his cocaine use is at the root of his health issues—but in a narrative sense that’s been especially invigorating all season, even as it betokens the problems seemingly destined to bring Mutiny down. Shifting the focus to Mutiny (and Donna and Cameron) means drawing from the same underdog well that the final episodes leading up to the unveiling of the Giant last season drank from. Here, as there, we’re put in the position of rooting for people trying everything in their extremely limited power to make their dream a reality, a much more relatable situation than watching Joe MacMillan’s hooded eyes scan the landscape for the path to power and glory. But, in racing ahead this season, the characters are all stretching themselves too thin. Plus, the Mutiny storyline gives us Kerry Bishé and Mackenzie Davis to root for, two actresses who’ve only grown more impressive the more screen time they’ve gotten. And while their conflicts aren’t anything new in themselves (Cameron’s a lousy businessperson, Donna accuses Cameron of planning to shut down her chat forum Community because she, not Cameron, thought of it), Bishé and Davis have a real chemistry, Donna and Cameron finding common ground in their respective plights less out of any overt feminist agenda on the show’s part than out of a mutual, if grudging, respect for each other’s skills. When Cameron, after inadvertently insulting Donna’s marriage in public via the world’s first misuse of social media, apologizes, Donna’s anger might be couched in prosaic terms (“How is anyone supposed to respect me when you’re disrespecting me?”), but Bishé and Davis convey a great deal of what their joint venture actually means to them both. Without saying it, they both know that their survival depends on sticking together. It’s powerful. As I said at the beginning, Mutiny can’t become anything, just as Cardiff couldn’t. That puts Cameron and Donna in the position of making technological advances and coming up with innovative ideas that necessarily will be credited to someone else down the line. It lends a poignancy to Donna’s exhortation to the programmers to stick with Mutiny despite their inability to pay, “This is what we all signed up for…I think it’s a risk worth taking.” It’s also why Bosworth’s line to an mom angry at her son’s Mutiny credit card bills lands so feelingly: “Mutiny is the church. It’s where they find community. Sometimes it’s the only place.” Davis and Bishé (and now Huss) are all proving more and more adept at making Mutiny seem both believable as an incubator for all the best ideas, and a place where idealistic thinkers are destined to be forgotten. Say it ain’t so, Yo-Yo! Cooper Andrews’ big, beardy programmer is one of the few to reject the offer of Mutiny shares, lumbering out the door in the belief that they’ll never be worth anything. As small as their parts have been, Andrews and August Emerson’s Lev have brought a nice energy as Cardiff, then Mutiny’s, resident oddball comedy team. I can only hope the big lug realizes his mistake and rumbles back at some point. The showy dart gun scene (from episode and Boys Don’t Cry director Kimberly Peirce), with Cameron taking out her Mutiny coworkers, Doom-style, is scored to current punk band Ex Hex. Since the song, “Don’t Wanna Lose,” had me searching my brain for what forgotten 80’s band it was, I’ll allow it. The Dutch angles return in full force this week. They’re a clichéd way to say “edgy”, and they’re not impressing anybody. One of the Mutiny guys lets out a Wilhelm scream when he gets shot. After his pilgrimage to his family last week, Toby Huss’ Bosworth returns to set things right at Mutiny, charming the company’s best customers into resubscribing, and putting his avuncular managerial skills at Donna and Cameron’s disposal as well. Huss is just right in this role, here showing Bosworth find some of his old swagger, while retaining the deferential tone his new, diminished role has brought him. Bosworth spotted Cameron’s worth even in stifling Cardiff Electric. Now, at Cameron’s idea of a company, he finds a way to be himself again, without trying to assert more authority than he’s got. It’s such a canny, yet warm performance. Cameron and Tom finally get together, bonding over their shared, jabbering excitement over the technical challenges of Cameron’s 3-D shooter idea (and moonlighting stockboy Tom’s knowledge of where Cameron’s favorite candy is kept). After busting out of his snotty shell by talking Cameron down from a panic attack last episode, Mark O’Brien’s Tom is looking like a decent sort after all, and certainly a better match for Cameron than Joe. What’s most refreshing so far is that Tom’s affection started out as admiration for Cameron’s abilities—watching Cameron thaw towards the guy makes their coupling here feel both natural and complimentary to both characters. Bosworth doesn’t like Tom, though, so we’ll see. For all the trouble Donna and Gordon’s marriage has in store for it, there’s hope in Donna’s sincere “It’s really nice that you get it” when Gordon tells her to fight for Community because she created it. Any time a show has someone casually tell a woman character she’s not looking good, that woman is pregnant. So, Donna is pregnant. It’s not the most promising storyline to drop into the midst of what’s becoming a compelling Mutiny plot, but Bishé and McNairy are outstanding in the scene where she secretly finds out, her conflicted emotions (considering Cameron’s characterization of her as trapped in her marriage to Gordon by her kids) contrasting with Gordon’s similar moment of dramatic irony, urging her from outside the bathroom door to see a doctor “just to rule out anything serious” and exposing his fears about his own health. The last shot lands with quiet power, as he sits silently, his hand flat against the closed door, both scared, both having no idea what to do.